You have to balance two decisions : Where on The Cape to stay and what kind of lodging to stay in. There are reasonable arguments for each location. However, we recommend staying on the Outer Cape, from Wellfleet to Provincetown. What you are coming to see and do is there. 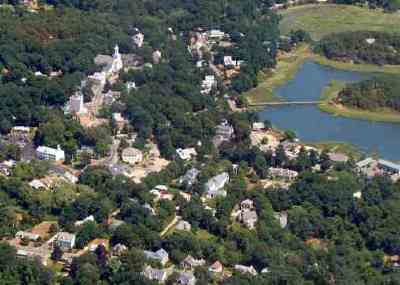 If you're looking for a classic inn, bed and breakfast, or campsite , we recommend the town of Wellfleet, above left. It is a tourist attraction all by itself. An old Puritan village founded in 1650, Wellfleet made a living as a whaling and fishing center for 300 years and is now primarily an upscale tourist center. Tight zoning laws have preserved most of the town's original flavor, with ship captains' homes and a classic harbor. Eight managed beaches and an expanse of dunes, forest, grasslands and freshwater kettle lakes surround Wellfleet. Camping is two miles away. A variety of great restaurants is available. Charter fishing boats operate from its docks. Bike trails, kayaking, surfing, boardsailing and a lively nightlife are available. Wellfleet is a Cape Cod version of Nantucket. Inn. Singles and Couples should really consider staying at one of The Cape's fine inns, and we recommend the Inn at Duck Creek, pictured top right. Innkeepers are Bob Morrill and Judy Pihl. This is an absolutely beautiful facility on five acres overlooking Wellfleet. It contains two restaurants, The Tavern and Sweet Seasons, both highly recommended by Northeastern reviewers (see our restaurant section for details). Duck Creek is half a mile from Duck Harbor Beach and 3/4 mile from Ryder Beach. It is also half a mile from the Wellfleet downtown, with restaurants, shops and docks. This means you can walk or bike.There is a great porch overlooking a duck pond. Rooms are very impressive, as shown at left, and quite reasonably priced considering the high cost of all lodging along the Massachusetts Coast. 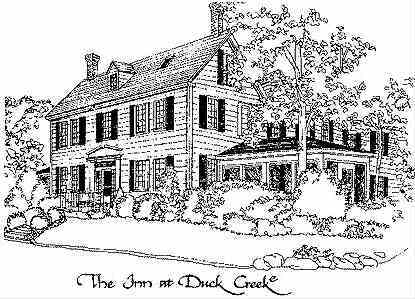 Duck Creek has been voted best inn on The Cape two of the last three seasons. Bed & Breakfast. A Bed & Breakfast is an inn without a full service restaurant. Considering the number of good restaurants in Wellfleet and Provincetown, this may not be a disadvantage. We recommend The Stone Lion.Inn on Commercial Street in downtown Wellfleet. Built in 1871 by Captain Freeman Snow, the house remained a private residence for 110 years, then became a bed and breakfast in 1981. Even though it is downtown, the Stone Lion still sits on its original large landscaped lot, with a wisteria covered gazebo, fish pond and lawn. The house looks impressive ouside, but the interior is classic. 503-349-9565. www.stonelioncapecod.com. Motel. If you have a group but don't want to camp, you need a motel. We recommend the Provincetown Inn, a 100 room resort at the very tip of The Cape, surrounded by water on three sides. There is an outdoor pool and private beach, with Herring Cove and Race Point Beaches right next door within the National Park. A shuttle bus runs two miles into downtown Provincetown. A seven mile biking trail winds through the dunes and and you can drive, hike or bike out to the point where the Mayflower washed ashore, sails torn and rudder splintered, after the hurricane. Provincetown Inn is historic in its own right, being the oldest hotel still standing on the Outer Cape. Murals on the walls are on the national registry. We like the original 1910 wing but all rooms are nice. The restaurant is good but may not open the first week of June. Hostel. If you're really on a budget but don't want to camp, we recommend the Truro Hostel on North Parmet Road in Truro. 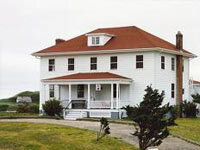 It is a historic building high on a cliff over the ocean, with Ballston Beach far below. You do have to have a membership in the world hostel organization, but you can join before leaving home. Just be aware this is dorm style lodging, with bunk beds and shared rest rooms. This is the most isolated lodging on The Cape, with two mile stretches of empty beaches in either direction. Unfortunately, the Truro Hostel is not open prior to about June 20, so if you're making the early Summer trip as we recommend, this won't be available. Recently, there is also some confusion about accepting large groups, so you should call or email well in advance. Truro Hostel historically has not only welcomed Scout and school groups, but offered special programs for them. Now the website says "no groups allowed." Check ahead. For Camping, we recommend Paine's, just outside Wellfleet on Old County Road, a short walk or bike to four oceanside beaches. 150 sites are available, some of which are group and walk in sites. Paine's caters to tents, with only a few RV/trailer sites. Paine's is at the northern end of the Cape Cod Rail Trail, which sadly does not extend all the way to Provincetown even though the original rail line did. The campground is in tree cover, but within sight of where the trees open out to dunes and beach. Paine's is two miles by bike into the town of Wellfleet, and a one mile walk to the site of Marconi's original telegraph. Hot showers are provided. Phone 508-349-3007. www.campingcapecod.com. . If Paine's is full, or if you want to be closer to Provincetown, Horton's is near Cape Cod Lighthouse outside of North Truro. As you lay in your tent the beacon will sweep the sky overhead. Horton's has the highest percentage on The Cape of RV and trailer sites, but tent sites are still nice. Tree cover here is less and many sites are in open grassland. You're within walking distance of two managed beaches, a long stretch of wild beach, the Museum, The Highland Educational Center and the lighthouse, which is open for tours and has its own museum. Horton's is six miles of level biking from Provincetown. You're a mile from groceries in North Truro. 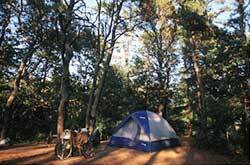 Horton's is the only campsite offering a laundry facility, which becomes important if you're staying for several days. 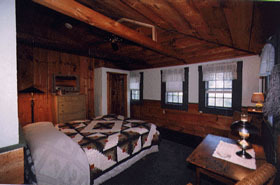 Phone 800-252-7705. www.hortonscampingresort.com. Early June should not be a problem, but if you come later, campsites are in great demand and Paine's and Horton's may be full. In that case, Nickerson State Park is down at midcape, 30 miles from Provincetown, which eliminates bike use and makes for longer drives back and forth. However, it's a great place to camp. There are 420 sites, in the woods as shown at right. These sites are on the shores of eight freshwater kettle ponds formed by glaciers 10,000 years ago and full of trout. The Cape Cod Rail Trail, the old Provincetown Railroad right of way converted to bicycle use, passes right through Nickerson. 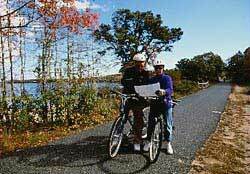 You are a close bike ride from Skaket Beach on Cape Cod Bay, and a five minute drive from groceries in the town of Orleans. Nickerson has timed showers taking coins for three minutes of hot water. Phone 508-896-3491. www.reserveamerica.com. .